identify whether one is primary and the other secondary, or whether the gene in question acts directly in both affected processes. For example, spermatids in males mutant for proteins required for nuclear shaping fail to individualize, because correct shaping of the nucleus is required for the normal assembly of the investment cone (27). Mutations affecting spindle structure may show defects in both chromosome segregation (uneven nuclear size at onion stage) and cytokinesis (Nebenkern larger than wild type and fewer in number) because of the relationship between spindle structure, especially the central spindle, and the cleavage furrow. Cell division is an extremely dynamic process; however, the transient nature of standard squash preparations observed by phase contrast yields only snapshot images of meiosis. In many cases, it is desirable to observe cells undergoing the divisions using time-lapse microscopy (40,41). By observing living cells, we can characterize in much more detail the exact nature of any meiotic defect. For example, a four-wheel-drive phenotype, where karyokinesis is unaffected but cytokinesis fails (e.g., Fig. 7D), could be the result of one of two fundamentally different defects. There may be a failure in the contractile ring, such that there is no contraction; alternatively, the intercellular bridge that should remain after incomplete cytokinesis may not be stabilized (42). Observations of living cells can rapidly distinguish between these possibilities (32). For analysis of live specimens undergoing meiosis see Subheading 3.1.3. and Chapter 3. 1. Dissect testes from a newly eclosed male in fresh testis buffer (0-1 d old) (see Note 2). 2. Place a drop of testis buffer on a clean microscope slide, using the surface tension of the buffer transfer the testes to this drop. 3. Open up the testes (and seminal vesicles if looking for motile sperm) by cutting them open with the tungsten needles or by ripping with the forceps (see Note 3). 4. Place a clean cover slip over the testes; this will gently squash the cells. Squashing can be increased to give better phase contrast by wicking buffer out using a Kimwipe. This can be done while observing the cells under the phase-contrast microscope (see Note 4). Nuclear morphology can be examined in live squashes by staining the DNA with the vital dye Hoechst 33342. This is included in the testes buffer at 2-5 ^g/mL during dissection. 1. Proceed as described in Subheading 3.1., but allow the testes to sit in the buffer for 5 min after dissection and before adding the cover slip (see Fig. 1I-L). Alternatively, chromatin can be observed using a stock carrying a His2-GFP transgene (41) (see Fig. 5). Meiotic chromosome morphology can be assessed in acetic acid squashes. 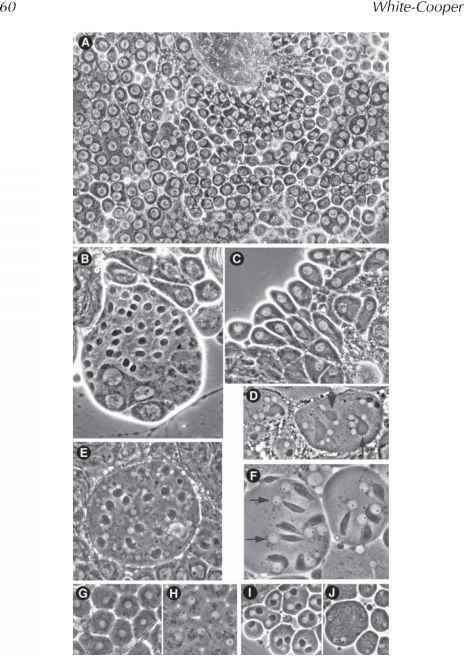 Because acid destroys much of the cellular structure, the morphology of the squashed testis will be compromised; however, condensed meiotic chromosomes and sperm heads will be visible (14). 1. Dissect testes as described in Subheading 3.1., step 1, then transfer to 45% acetic acid on the slide, and allow to swell for 15 s before cutting. 2. Proceed to step 3 of Subheading 3.1. 1. Dissect out the testes and place into a large drop of halocarbon oil on a cover slip. Remove as much nontestis material as possible from the preparation. 2. Cut the testes open and spill the contents out by pulling the sheath around the cover slip. 3. Pick up the cover slip with a slide and observe with phase-contrast optics for up to 1 h (32). The addition of extra cover slips (or pieces of cover slip) as supports alongside the testes prevents oversquashing and increases the viability of the cells to 2 h (see Note 5). Fig. 7. (continued) meiosis, and four are still primary spermatocytes. 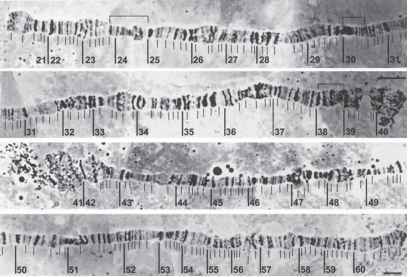 (C) No meiotic divisions (e.g., twine, boule, mgr, p2-tubulin): Failure to form a meiotic spindle results in failure of both chromosome segregation and cell division. Onion stage cysts can be seen containing 16 rather than 64 cells, each having a large (4N) nucleus and a large (usually misshapen) Nebenkern. (D) Cytokinesis failure (e.g., fwd, shank): Normal chromosome segregation followed by failure of cytokinesis at both meiotic divisions results in an onion stage cell (arrow) containing four nuclei associated with just one very large mitochondrial derivative. If only one cytokinesis fails, two nuclei are associated with one large mitochondrial derivative (arrowhead). (F) Chromosome nondisjunction (e.g., asp, compound chromosomes): Chromosome nondisjunction results in one daughter nucleus having more DNA than its sister nucleus. Because the nuclear size at onion stage is directly proportional to DNA content, this is manifest as variable nuclear diameters in early spermatids (compare arrowed nuclei). (E) Cytokinesis failure and chromosome nondisjunction: Mutants that affect both cytokinesis and chromosome segregation can result in postmeiotic cysts containing 64 variable-sized nuclei associated with 16 large Nebenkern. (G,H) No mitochondrial derivative (e.g., nmd): Failure of mitochondrial aggregation and fusion results in a cloud of mitochondria in onion-stage cells (G). At the leaf blade stage (H), they are scattered, mostly to one side of the nucleus, but a normal Nebenkern is never formed. (I,J) Mitochondrial fusion (e.g., fzo): At onion stage, mitochondria aggregate but fail to fuse. Wrapping of pairs of mitochondria forms a Nebenkern, which at this stage (I) looks somewhat lumpy. By the comet stage (J), many individual mitochondrial pairs are seen elongating from each nucleus. Panel E was provided by Cayetano Gonzalez (EMBO), and panels G-J were provided by Karen Hales (Davidson College). Because in each preparation only one field can be imaged, it is wasteful to dissect more than one male per slide. Care should be taken in choosing the image field; cells near the edge of the displaced testis contents may be easier to see, but will die sooner than those that remain surrounded by other testis material in slightly more physiological conditions. Cytokinesis seems to be more sensitive to perturbation than chromosome segregation. If the aim of the experiment is to observe cytokinesis in a mutant, it is best to select cells in anaphase at the start of the recording session. Cells can easily fuse during preparation of the slide; if two cells in meiotic prophase are artificially fused, both spindle morphology and kinetochore attachment to microtubules may be disrupted. The effect will be an aberrant meiosis, and often failed cytokinesis, which could be misinterpreted as representing the true mutant phenotype.